America won’t change if you don’t vote on Nov. 6, but it also won’t change if you don’t complain, hashtag, protest and risk everything in the 57 days before you go to the polls. As the first full slate of NFL games kicked off this Sunday, it was hard not to feel that this peculiarly American institution entering its 99th season was haunted by a ghost - a presence that was not on the field yet felt palpable to anyone watching. OK, maybe that’s because the image of Colin Kaepernick - the man who wasn’t there, the quarterback whose odyssey took him from Super Bowl starter to banned outlaw, icon of social injustice protest and bête noire of no less than the president of the United States - looms so large. Aided by his deep-pocketed corporate sponsor, Nike, the image of Kaepernick and his big-bang Afro towers over San Francisco’s Union Square and Manhattan’s Times Square, and a glitzy ad featuring Kaepernick and sporting idols like Serena Williams (quite a fitting juxtaposition, as we’d all see just two days later ) crashed the party that was Thursday night’s nationally televised Eagles’ victory. I’ve been thinking about Kaepernick these last few days as the end of summer brought not only the return of pro football but the reemergence (don’t call it a comeback) of Barack Obama to American politics. The 44th president’s first campaign-style speech, delivered Friday at the University of Illinois, walked the tightrope between the historical constraints we place on our ex-presidents and the need to sound the alarm about rising authoritarianism. Although Obama’s speech made headlines for calling out Trump by name, there were also several moments when the Kaepernick Quandary hovered over the ex-president’s address, not unlike the QB’s haunting of the NFL. The remarkable transformation that we’ve seen in the last couple of years - how voters evolved in a place like Philadelphia from the pro-mass-incarceration, pro-death-penalty polices of a district attorney like Lynne Abraham to the revolution that is the new DA Larry Krasner - got a shout-out during an Obama broader riff on the importance of turning out this November. The ex-president is right, of course. Having witnessed Krasner’s ascension here in Philly, it would not have happened without an engaged electorate, and a get-out-the-vote drive that included new players from the ACLU to the formerly incarcerated. But the election of a prosecutor committed to ending mass incarceration wasn’t the beginning of a process; it was the culmination of one. What actually happened here was different from the implicit message in Obama’s speech that if you desire change in America, nothing really matters except voting. Obama managed to get it both right and wrong in that one key riff. Complaining without voting is indeed an empty and somewhat hypocritical way to live your political life. (And, indeed, the most valid criticism of Kaepernick is that he has failed to vote.) But at the same time, voting without complaining - especially, risk-everything protest that changes the conversation and calls attention to the gross contradictions in American society - can often be a futile gesture as well. That’s because protesting and complaining - even, yes, hashtagging - create the conditions where your vote actually matters. In fact, it was during Obama’s eight years in the White House that millions of progressive-minded Americans - many of whom had once thought that the Democrat’s Nov. 2008 election had been the dawning of an Age of Aquarius - launched two of the most successful (despite all the ridicule) protest movements in modern U.S. history. 2011’s Occupy Wall Street movement started a national conversation about an issue that elected officials in Washington pretended did not exist - income inequality - and morphed into the Bernie Sanders movement and now into majority support for issues like Medicare-for-all, a $15 living wage and ending student debt that weren’t even on the table seven years ago. It was beyond irony that Obama endorsed Medicare-for-all in his speech Friday - after not pushing for it during his eight years as (checks notes) “leader of the free world.” Obama’s change of heart happened because of a protest! Then there’s the #BlackLivesMatter movement that arose from the ashes of the killing of Michael Brown and the subsequent unrest in Ferguson in 2014. Again, very few people were talking about the disproportionate killing of black men by police - let alone related issues like America’s insane incarceration rate or the unfairness of policies like cash bail - until these risk-taking folks hit the street. Again, Obama was president for eight years - but it was only after #BlackLivesMatter protests that he visited a federal prison and spoke out against mass incarceration. 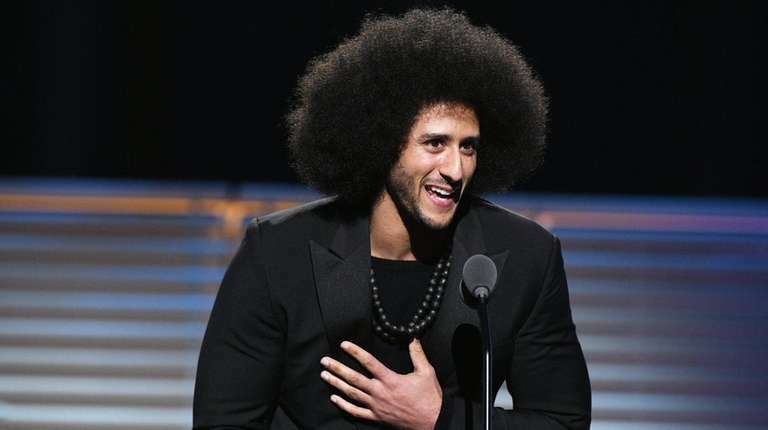 Kaepernick didn’t start the #BlackLivesMatter movement, but his decision to kneel during the national anthem in 2016 marked something of a turning point. That’s because protests are most effective when they can no longer be ignored by those most resistant to change, and so bringing the fight against police brutality to the top-rated, all-American spectacle that is the National Football League was an act not just of conscience but also bold creativity. Flash forward to 2017 and ’18 and election of reform-minded prosecutors like Krasner, Boston’s likely next DA Rachael Rollins, and St. Louis’ Wesley Bell, a Ferguson councilman who upset the prosecutor who failed to charge the cop who gunned down Brown. Yes, they were elected by votes - but it’s hard to imagine an America where candidates like them would have been anywhere near the cusp of an electoral victory without people marching or NFL athletes kneeling and thus creating the climate where citizens hungered for radical new approaches. Indeed. Obama’s “don’t complain” seems like a bizarre message in the wake of the 3 million to 4 million who took part in the 2017 Women’s March, which spawned literally hundreds of first-time women candidates, who will in turn be giving people a reason to go out and vote on Nov. 6 that they might not have felt otherwise. And while all Americans can probably agree about losing the “ironic detachment,” even “don’t hashtag” is kind of an insult not just to #BlackLivesMatter but also to the #MeToo movement, which has brought the biggest revolution in gender politics in the last 40 years. Meanwhile, conventional politics is bringing us the sham that is the confirmation of future Supreme Court Justice Brett Kavanaugh, which is why dozens of everyday Americans were arrested at his hearings. America won’t change if you don’t vote on Nov. 6, but it also won’t change if you don’t complain, hashtag, protest and risk everything in the 57 days before you go to the polls. And the ghost of Colin Kaepernick’s NFL career is your living proof.